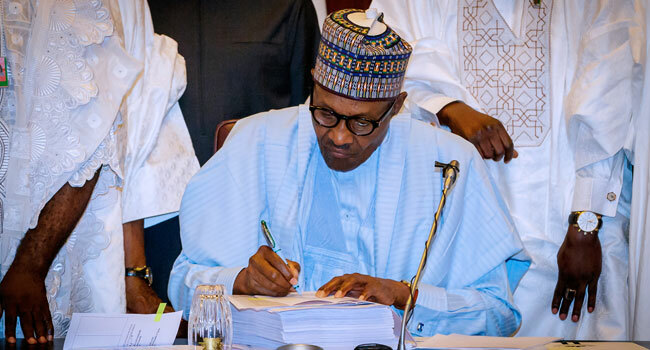 President Muhammad Buhari on Wednesday finally signed the 2018 appropriation bill into law. The President assented to the bill more than a month after it was passed by the National Assembly, and over seven months after he presented the proposal to the lawmakers. When I submitted the 2018 Budget proposals to the National Assembly on 7th November 2017, I had hoped that the usual legislative review process would be quick, so as to move Nigeria towards a predictable January-December financial year. The importance of this predictability cannot be overemphasised. It is in this regard that I am concerned about some of the changes that the National Assembly has made to the budget proposals that I presented. The logic behind the Constitutional direction that budgets should be proposed by the Executive is that it is the Executive that knows and defines its policies and projects. Many of the projects cut are critical and may be difficult, if not impossible, to implement with the reduced allocation. Some of the new projects inserted by the National Assembly have not been properly conceptualised, designed and cost and will, therefore, be difficult to execute. The provision for security infrastructure in the 104 Unity Schools across the country was cut by 3 billion Naira at a time when securing our students against acts of terrorism ought to be a major concern of government.